Quite often when watching a sporting game of some sort, with real high quality, some insufferably smug git (often me TBH) will say something along the lines of “Football/Cricket/Kabaddi was the real winner”. I think it is fair to say that no one will be saying that about boxing after the events leading up to, and after the fight in Munich last night. It would be probably dishonest to pretend that “shenanigens” and the sense of danger wasn’t a part of the appeal of the sport of boxing, bad dangerous lad getting into a ring and beating seven bells out of one another is an intoxicating mix. And whilst we accept that there will be bad words, and bad blood before hand it is often we think all about selling tickets. One of the great things about boxing is that after all the words, all the deeds and after spending half an hour beating the crap out of one another boxers tend to have a big embrace at the end. The sight of two sportsmen sat next to one another giving a joint interview with the media is not uncommon. So what happened at the end of the fight, and then afterwards last night was all the more unsavoury. Chisora had gone out of his way to wind up the Klitschkos, claiming (with some justification) he had been treated badly by them. And clearly Wlad was way out of order going into Del Boy’s room and having a hoo ha over his gloves and strapping. 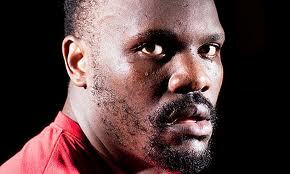 All the same Chisora’s “spit” in Wlad’s face was too much, far too much. Spitting is a line that really we just don’t expect sportsmen to cross. So the ugly confrontation between Chisora and the Klutschkos at the end of the fight had a real edge, it was unpleasant. I went to bed at this point (that’s the kind of all action winner I am, in bed by half eleven on a Saturday night. I know what you are thinking = “Winner”!) so was unaware of what was farce degenerating into something worse. On getting up I decided to “check teh interwebs” and saw the headline about the brawl and assumed it was just a load of stage managed ticket selling. But unfortunately it was worse… much worse. If Del Boy had come close to the line with his slap, if he had crossed it with his water spit then he went charging over it with the press conference. This was an embarrassment to the sport, lord only knows what was going through Chisora’s head, but we know he is a nutter. Haye, for all his conflabs and stunts, is obviously a reasonably smart cookie and I don’t know why he allowed himself to get into this position. Of course once Chisora marched down there aint a boxer in the world who would high-tail it out of there all the same a calm head was needed and they were sadly lacking. Let’s not forget there was an actual world heavyweight title fight happening and whilst Chisora might have disgraced himself in every way out of the ring, inside the ring he did anything but. He was brave, tough and he really had a go. Vitali might not admit it but he was in the toughest fight he has had since he fought Lennox. Vitali was blowing several times, and he took a fair few whacks. If Chisora had been a bit quicker, a bit stronger and had a little more sugar he would have had a damn good chance of bringing a belt home. But he wasn’t and he lost by a wide margin in what was a fair result from the judges. At the final bell though Chisora was on the verge of a redemption story given the performance he had put in which makes the subsequent actions all the more of a shame. It is interesting to speculate what will happen next. Vitali is declining, I blogged in November 2010 that I thought Haye would be better off fighting Vitali and that seems all the more true to me now. I honestly believe that David Haye would have beaten Vitali last night, he is stronger, quicker and better than Chisora (by some distance frankly) and Vitali is in decline. I suspected last night that Del Boy would have pretty much retired Vitali. Boente (The Klitschkos manager) would, I thought, be mad to let Vitali get in the ring with Haye. And it seemed that Boente’s comments post fight (“No, No, No you had your chance and it is gone”) backed this up. Interestingly the Observer Journalist Kevin Mitchell seems to be suggesting that privately they accept they will have to fight because that is the only money fight left for Vitali. This makes sense I suppose, and I would still like to see it. But I shan’t hold my breath. All in all, once again the sport of boxing is shamed. As a fan it is so disappointing to keep saying this. But the fights not getting made, ridiculous alphabet belts, conflabs like this are ruining the sport. With Fury ducking Price, Mayweather and Pacqiaou no getting it on I am a very depressed fight fan. Let’s hope Kell Brook and the Khan vs Petersen rematch can give us a little redemption, British boxing needs it….